KUALA LUMPUR, 18 May 2014 – A vaccine for Influenza that is acceptable to people of all faiths should be developed by pharmacy researchers at The National University of Malaysia (UKM). 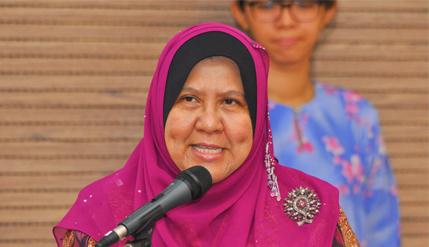 Deputy Vice-Chancellor (Students and Alumni Affairs) Prof Datin Nor Aziah Mohd Awal said a major barrier to acceptance of vaccines is that some Muslims and Hindus doubt certain types of medicines given free by the government comply with their religious beliefs. Closing a three-day National Clinical Pharmacy Challenge organised by the Faculty of Pharmacy here today, Prof Nor Aziah, a Law professor, said under the Child Act 2001 every child has the right to receive treatment when made available that could improve their health. The Act provided that anyone refusing to take his or her children for vaccination whenever a pandemic occurs in this country or overseas can be taken to court for neglect of duty to the dependents. However, the perception that some vaccines may contain compounds from porcine or bovine origins still persists and creates suspicion and even outright opposition to the dispensing of such treatments. She urged that vaccines that are universally accepted be produced that do not use components derived from animal organic compounds. From an Islamic point of view it is the duty of scientists to find a suitable vaccine that is ‘halal’ and acceptable to people of all faiths. “It is not just an option for Muslims, it is mandatory,” she said. Prof Nor Aziah said it is also the duty of pharmacists to counsel patients and consumers about the use of drugs and medicines to avoid misunderstandings that could lead to appalling errors in judgement or perceptions. The law has made it very clear that any purported cure or medicine must explicitly state its effectiveness to the patients and medical practitioners. Failure to comply with the claims made by the pharmaceutical companies would be a violation under Contract Law. “I and every law student remember that the very first example of violation of Contract Law in medical terms occurred in a case where a pharmaceutical company was sued by a patient over a ‘Smoke Ball’ cure for influenza in Britain in 1891,” she said. She was referring to the celebrated landmark case Carlill v Carbolic Smoke Ball Company (1892) an English contract law decision by the Court of Appeal, which held an advertisement containing certain terms to get a reward constituted a binding unilateral offer that could be accepted by anyone who performed its terms. She noted that the just-concluded Pharmacy competition, which was organised jointly by the UKM Pharmacy Students Association and the Malaysian Pharmacy association, did have a category that stressed the importance of truth of advertising and client counselling. Also present at the ceremony were Dean of the Pharmacy Faculty Prof Dr Ibrahim Jantan, the Deputy Dean Assoc Prof Dr Mohd Cairul Iqbal Mohd Amin and Vice-President of the Malaysian Pharmaceutical Society Abida Syed M Haq.